Stream Weaves' New Album, 'Wide Open' The raucous rock band's sophomore album combines the energy of punk rock with the earnestness of Springsteen. When Jasmyn Burke is on tour with her band Weaves, she meets a lot of young women and women of color who tell her they've never seen someone who looks like them represented in a rock band before. That type of iconic status — while flattering — can complicate an artist's intentions. It might cause someone to focus entirely on personal perspective — to channel an artistic vision distinct from the goals of representation — or to sacrifice individual flair by solely working to push back against expectations and norms. But Weaves' sophomore album, Wide Open, does neither. Instead, it channels that pressure into something inclusive and celebratory that borrows from rock tropes but explodes them with wide-eyed optimism and ingenuity. From its opening moments, Wide Open rings out like an anthemic Springsteen fantasy: "I was a fighter hoping for freedom / I was a fellow walking the streets / I am a woman who feels the plight of these walls," Burke sings over enormous rock guitars on "#53." The similarities to The Boss were purposeful. "In a way I was thinking about [songwriting] like Bruce Springsteen," Burke says in a press release about the album, "but in a lot of ways my experience of the world couldn't be less like Bruce Springsteen's." And this contrast is, in effect, what makes Wide Open feel fresh and magnetic. Burke's point of view, and her singularly charming, expressive voice wring a unique perspective from the band's dependable — if slightly off-kilter — songs. Guitarist Morgan Waters fits stadium-sized guitars into riffs that sparkle at odd angles like bite-sized diamonds; bassist Zach Bines and drummer Spencer Cole form a backbone that grooves endlessly. And Burke's lyrics are full of the kinds of introspective appraisals and outward-looking commandments that feel like they were written with the young women who approach her at shows in mind. "The world is wide open," she sings on the album's title track. On "Scream," a terrifyingly cathartic collaboration with Tanya Tagaq, Burke exhorts listeners to "get up on the table and scream your name." Elsewhere, Burke shares smaller, though no less acute, pains of daily life — blown up, as Burke would say, from regular life to anthems. On "Gasoline," she sings about working a dead-end job over a driving beat; on "Slicked," she sneers "I ain't looking at you" over explosive, jagged guitars. The band has described Wide Open as its Americana record, though the songs only bear a passing resemblance to the genre. There's pedal steel on the title track and a touch of twang on "Grass," but the songs, in general, flirt across genre lines: bombastic rock, jangly art-pop, freaked-out fuzz. Whereas the songs on the band's self-titled debut retrofitted pop structures over janky, vertiginous melodies and syncopated rhythms, Wide Open works the other way around: It feels hell-bent on injecting art-rock weirdness into a pop-music mold. 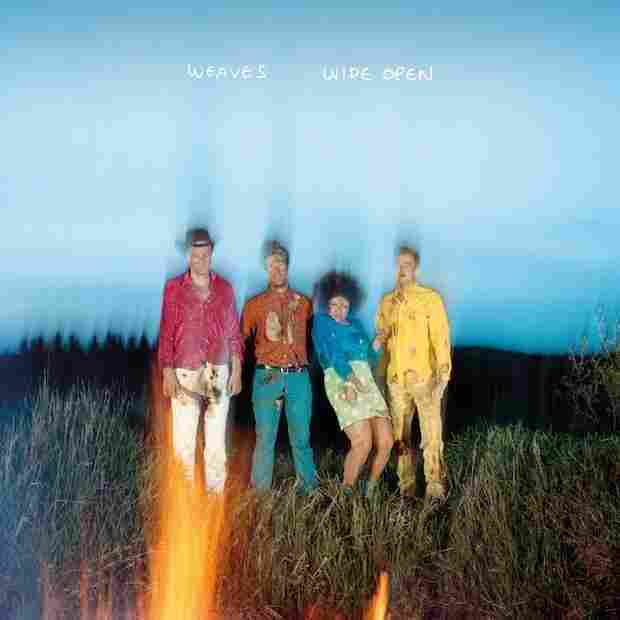 Wide Open finds Weaves tightly coiled and finely tuned, anthemic in its own freakishly fun way.